The Board of Directors is composed of the Directors of OFE ltd. and is responsible for financial and administrative matters. The Executive Council is composed of one representative for each of OFE’s Subscribing (corporate) Members, Partners and Supporters, and members of the Board of Directors. It meets quarterly and decides on the strategic orientations of OFE. 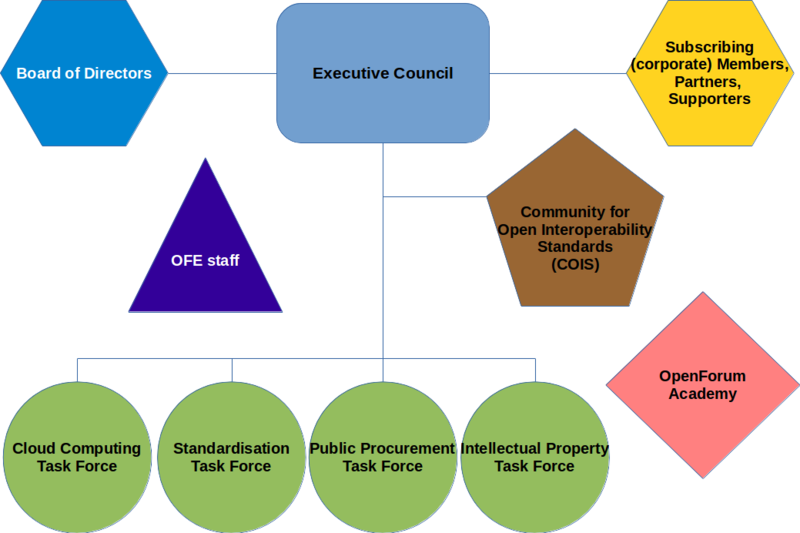 Each of the Task Forces is chaired by one of OFE’s member or partner. These groups are used to coordinate activities with a particular focus. They report back to the Executive Council. The work of OFE is also supported by the OFE staff who make sure that everything is running smoothly. OpenForum Academy has been set up as an independent programme and is run by the OFA Fellows themselves, with the support of the OpenForum Academy Fellowship Coordinator. The Community for Open Interoperability Standards (COIS) pursues OFE’s mission in the UK. It functions independently and has its own group of supporters, but ultimately reports back to the OFE Executive Council.